Students engaged in a large march and rally on campus Nov. 16, one of several around the country, to express concern for students whom they see as marginalized after a divisive election season. PROVIDENCE, R.I. [Brown University] — Clad mostly in black, hundreds of Brown University students were joined Wednesday afternoon by members of the local community in marching through the central part of campus to University Hall, Brown’s central administration building. 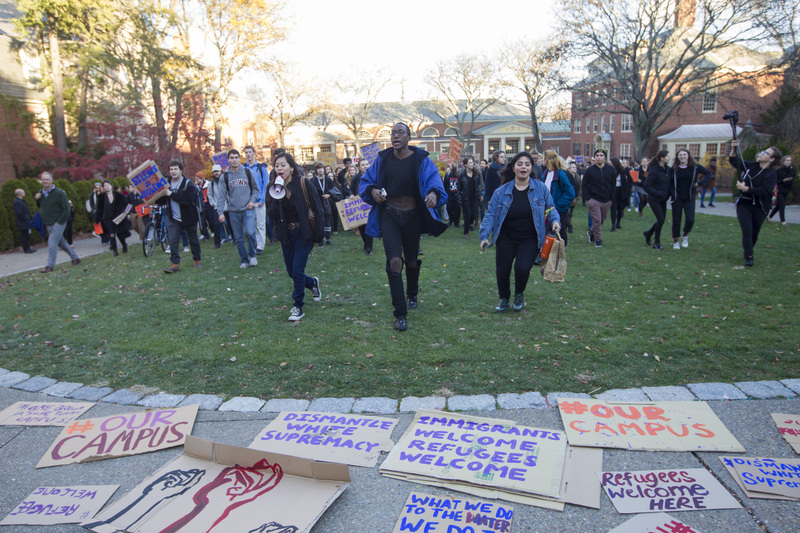 The marchers during the Nov. 16 event at Brown, many of whom held signs including “No human is illegal” and “Refugees are welcome here,” focused in particular on a deep sense of insecurity many feel amid pledges from President-elect Donald Trump to call for millions of deportations and tight restrictions on new immigration. They also spoke, held signs and chanted in support of the Black Lives Matter movement, against the Dakota Access Pipeline, and in support of students with disabilities. Students gathered and then marched, chanting in unison on behalf of diversity. Later in the march, a delegation of students entered University Hall to present a sheet of demands before returning to the Quiet Green where the megaphone was left open for any one of the marchers to speak. Among the organizing hashtags of the event was #SanctuaryCampus, which refers to requests that universities protect immigrants facing deportation. Earlier in the day, Brown University President Christina Paxson and Provost Richard Locke published an op-ed in the Brown Daily Herald responding to three recent petitions to make Brown a sanctuary campus. “We join our faculty members, students and alums in expressing the feelings of deep empathy and desire to protect members of our community that have motivated these petitions,” Paxson and Locke wrote. They discussed what the University has been doing to support undocumented students, including those brought here as children. Many students at Wednesday’s march also raised issues about diversity on campus, citing enrollment of historically underrepresented minority students and hiring of faculty from underrepresented backgrounds. Students showed support for immigrants, refugees, and minorities while denouncing racism and other threats to marginalized populations. In advance of the March, the student organizers had sent a list of demands focused on these issues to Brown’s president and provost, who informed the students they would be unable to attend the march. “Like you, we are committed to supporting the needs and interests of our undocumented and DACAmented students, who are justifiably uncertain, fearful and anxious about their futures. We have been working with these students to provide care and support, and remain committed to protecting them. We have also been very clear that this University will not tolerate racism, sexism, homophobia, islamophobia, or any form of hateful targeting of marginalized groups. The email referenced Pathways to Diversity and Inclusion, a plan that details a set of concrete, achievable actions that aim to make Brown more fully diverse and inclusive. Last year the University engaged in a campus-wide process to develop the plan, and implementation has been underway since then.